The iPad Pro is the ultimate productivity tablet for professional creatives, and is well worth its lofty price tag, even if there are still some unfortunate compromises stopping it from being a laptop replacement. When you’re shopping for tablets, considering an iPad is almost inevitable. Launched in November of 2018, Apple’s new iPad Pro (11-inch) promised the world a number of bold changes to the original design, with sharper screens, better multitasking options, and a suite of new features that addressed past complaints. On the flip side, the Pro also commands a lofty price tag which raises the question, is this the iPad that can replace your laptop? We take a deep look at all aspects of its design, software, and performance to see if it lives up to those high expectations. The iPad Pro is easy to pick up with one hand and barely makes a dent in your backpack storage. It feels like a notepad, and you can use it as such. For what is inside this piece of kit, that is a marvel This device even fits snug into the accessory slot of a laptop sleeve if you’re planning to double up. It is dainty, but what makes it so wonderful is that there are no compromises to make up for this, design-wise. Apple’s latest revision does away with buttons and fingerprint sensors altogether to create an edge-to-edge screen with a smaller bezel. To still ensure a sense of security it ships with Face ID, popularised by the iPhone X. This means that after registering your face you can simply open up your iPad, and it will unlock almost instantly if you’re in view of the device’s front-facing camera, regardless of orientation. By removing most (but not all) of the bezel and sanding down the edges, the new iPad Pro has a far more stylish design than its predecessors. Perhaps one of the most striking decisions Apple has made here is the inclusion of a USB-C port, which replaces the Lightning port at the bottom of the device. This opens up a world of possibilities for most creative types, from easily connecting the iPad to a monitor, or even uploading photos you want to edit directly from your DSLR camera. The two main attachments everyone should consider when purchasing an iPad Pro are the Apple Pencil and the Smart Keyboard Folio. The Apple Pencil is a powerful tool for artists and note takers, and the revised model includes a double-tap feature so you can quickly switch between brush styles and utilize functions usually locked off to the more PC-focused professional drawing tablets. Previous Apple Pencil users will be glad to know that it charges with a magnetic pad on the side of the device, and not awkwardly through the port at the bottom like previous models. Yet, it does also drop the headphone jack, meaning you’re going to want a pair of wireless headphones or Airpods if you’re looking to edit video or listen to music on it in public. This would be ok if there was a USB-C to Lightning adaptor in the box, but Apple decided not to, which feels stingy, considering the price tag. The Smart Keyboard Folio turns the iPad Pro into a writing machine and is an incredibly slick attachment with barely any heft to it. Simply snap your iPad in and it will let you type straight away. The fact it doubles up as a folio means you can give your device some much-needed protection without sacrificing productivity. Multiple magnets in the case ensure that your iPad can be wrapped up with care and stored safely when you’re on the move. We wouldn’t call the iPad Pro child-friendly unless you wrap it in a rugged case and apply a decent screen protector, and even then it's a stretch. Due to all of the productivity features, we believe the best use case for the tablet is in the hands of professionals rather than families. It's for those who are looking for a premium tablet experience. Setting up the 11-inch iPad Pro is quick and painless, and strikingly similar to many of Apple’s other products. Once unboxed, we took the iPad out of its case and held down on the power button which led to the setup screen. Following this, we used our iPhone to scan the visual code on the screen which quickly linked the devices and ensured a smooth setup. If you don't own any other Apple products, you are led through a short set of screens where you pick your time zone, sign into your Apple ID, and connect to your WiFi. As part of the setup process, you also have to orient your head around the camera to ensure Face ID can set you up properly for the multiple viewing angles. Once everything has updated, you simply swipe up and are let loose into the Apple home screen from where you can start downloading and installing your apps. Apple is well known for its gorgeous screens, and the iPad Pro absolutely delivers. The display is what Apple is calling ‘Liquid Retina’, an upgraded version of the technology that drives the screen on the iPhone XR. Wonderfully rich color reproduction, crisp text can be found across all of Apple’s proprietary apps and third-party optimized software. Reading articles and watching video content on streaming services is wonderful, and it even fares well amidst glare from sunlight. It’s still an LCD screen though, so OLED tablets will still have better-looking blacks and richer, more saturated colors. Fortunately for Apple, there aren’t many of those in the market. There’s also some nifty usability features that come packed with the iPad Pro. True Tone is a feature that helps match the display to the color temperature of your surroundings, which makes the screen easier on your eyes. The 120Hz Pro Motion technology alters the refresh rate of the screen depending on your usage, which results in extremely fluid motion, from scrolling, to playing games, or watching video. It’s difficult to find a poor viewing angle, though you still can’t watch 4K video on YouTube, which is a crying shame given the power of the screen, but more of a problem between Apple and Google rather than a knock to the device itself. As touted by Apple during its launch presentation, the iPad Pro is said to be as powerful as an Xbox One S. This is true from a pure graphics perspective, but you have to consider that the iPad doesn’t have the same games or support, so while it is as powerful, it’s unlikely to replace your console anytime soon. What it does have though is an unparalleled chip in the A12X Bionic, an utterly astounding eight-core processor that never breaks a sweat. In testing, we played PlayerUnknown’s Battlegrounds, XCOM: Enemy Unknown, and Bully: Scholarship Edition which the iPad breezed through. It also functions perfectly with several intensive apps open. We tried switching between the games in-play to more productivity-focused tasks like video editing or sketching and it still never faltered. The A12X Bionic puts it leagues ahead of the competition, making it the most powerful productivity machine for professional creatives on the market. Our Geekbench 4 benchmarks put the iPad Pro’s Multi-Core CPU performance at 18090, almost double that of the previous generation model utilizing the A10X Fusion chip, which sat at 9301. Single core there was another significant jump, with 5019 to the previous iPad’s 3906. In our GFX Metal tests, the iPad really ran away from its competitors too. It scored 3407 frames in the Car Chase benchmark, almost double that of the Nvidia Shield, and nearly triple that of the previous iPad, running at an incredible 57 FPS (frames per second) compared to the previous iPads 23 FPS. It’s a massive, almost overkill leap considering the lack of AAA experiences available for the device, but it’s nice to have all that power in your hands. The 2018 iPad Pro is an absolute force of nature as far as productivity is concerned. 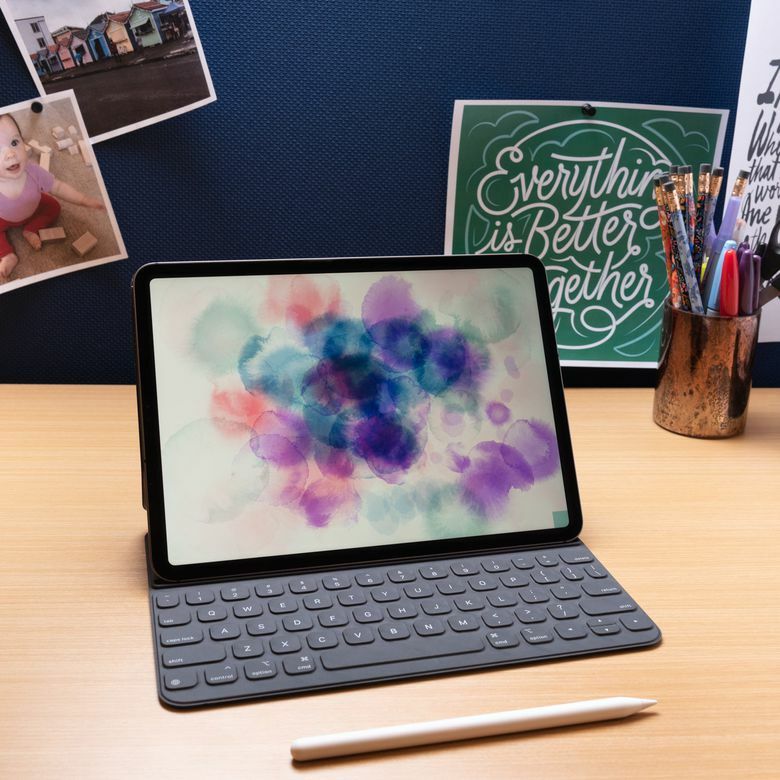 With the brilliant viewing angles, and options to attach both a nimble Apple Pencil and a Smart Keyboard to the device with relative ease, this tablet will suit the needs of many modern creatives and workers looking for an all-in-one device. Will it replace your laptop though? This is a major point of contention for people looking to take the plunge. Over our two week testing period we ended up using the iPad Pro for nearly every aspect of our workflow as a freelance writer, but we still don’t think it's quite there yet. The main feature that is an essential asset to your productivity is the Split View, that lets you bring up two apps from the dock that share equal (or 75/25) of the real estate of your screen. This means, for example, you could boot up Notability and Google Docs to transfer your notes into an article, or Procreate and Safari if you want to use a reference image whilst you draw. As you can imagine, the apps become intertwined thanks to the multitouch gestures, where you can drag words or images between the two and make your workflow far more efficient than it would be if you were using a standard laptop. A lot of apps are well integrated for iOS and often better than their PC counterparts, but it is still certainly a mixed bag, especially for Adobe power users, who still have to suffer watered down applications, though more fully-functioned apps are on the way. It cannot replace your laptop just yet, but it may well make it redundant based on your use case. Outside of that, you can’t connect some external drives, Thunderbolt devices or use a mouse. Split View is also certainly a compromise to professionals used to using more than three programs at once. One of the major upgrades to the Pro is the stereo effect audio playback with four powerful speakers, two on either side of the device. The iPad Pro has truly stunning audio, and if you crank it up it could easily act as a party speaker. There is absolutely no need for anything external when watching video content. Amazingly, the fidelity of the audio never seems to suffer, even at full volume. Apple ditching the headphone jack poses an interesting problem in that you’re going to need a pair of Bluetooth headphones or buy an adapter to receive audio on the go. In terms of signal strength, we struggled to get the WiFi to break by walking outside and away from our router. In the garden and the garage ( a usual drop-out spot for other devices) it held true in very reasonable fashion. We received 72Mbps download speed and 6Mbps upload on our 100Mbps plan, a very respectable result. Downloading apps was quick and painless, and thanks to the incredible processor, there was very limited buffering time when booting up YouTube videos, Twitch streams and streaming video content on Netflix. One of the only design compromises is the small camera bump on the back of the tablet that makes it wobble a negligible amount whilst flat outside of a case. It's still unwieldy to use, and whilst it’s a wonder why a tablet like this even needs a camera at all, Apple has actually given the tablet a camera worthy of the price tag. The rear camera is 12 MP and very similar to the technology seen in the iPhone XS. The 7 MP front-facing camera features the same ‘Portrait Mode’ technology found in the latest lineup of phones, meaning you can alter the depth-of-field on selfies which is a nice touch. FaceTime functions confidently without much blur, and you can record 4K 60fps video with absolutely faultless playback. The Pro is great for demoing Augmented Reality (AR) content, but after a quick search of the App Store and some googling, you’ll soon realize there are very few compelling AR experiences on the market, so this is more of a work in progress. Take a peek at some of the best camera apps you can download. This is an all-day device, and should last you roughly around 10 hours of regular use, as per our testing. We spent almost a full working day pushing it using Split View to draft articles, with some Procreate drawing and Netflix streaming in between, and the iPad Pro clocked out at around 9 hours. However, we found some apps like Google Docs drain the battery more than most, so it varies depending on your workflow. Much like the Apple Watch, if you’re not a power user this tablet could last you a number of days before needing a fresh charge. This is interesting because iOS 12 is by far and away the best version of the operating system yet, but there are still some blatant compromises that eat away at the possibility of the iPad Pro being a laptop replacement. You can't just unzip files. And moving photos or documents between programs, even cloud-storage services like Google Drive and Dropbox, is a nightmare. In most cases, it’s actually doable if you find the right app, but it’s always far too much busy work when its a very simple five-second solution on any laptop. This wasted time adds up, and iOS 12 starts to get in the way of the iPad Pro’s potential. Due to the particular size of the screen, developers have to update all of their apps to fit properly on the iPad Pro, but even months after its release there are many apps that throw up horrible black bars between the software and the device bezel. Snapchat and Instagram are mostly unusable too, unless you’re willing to compromise with a downscaled, emulated version of the iPhone app. iOS 12 is by far and away the best version of the operating system yet, but there are still some blatant compromises that eat away at the possibility of the iPad Pro being a laptop replacement. As far as tablets go, one of the main reasons many people are put off by the iPad Pro is the existence of far cheaper options. Our review model (11-inch, 64GB) retails for $799, and you may well be inclined to upgrade both the size and the capacity to suit your needs. This doesn’t factor in some of the more essential accessories with jaw-dropping prices like the Apple Pencil, Smart Keyboard, and the Bluetooth headphones necessary to navigate the lack of a headphone jack. That can lead to a very expensive purchase, and with Apple products, it can be hard to tell whether they are worth it case by case. Luckily, the 11-inch iPad Pro is such a revolutionary upgrade on most tablets that you do truly get what you pay for here. The A12X Bionic puts it leagues ahead of the competition, making it the most powerful productivity machine for professional creatives on the market. There is nothing really competing at this price range beyond. Nothing can really compete as far as power is concerned when it comes to the iPad Pro, so you’re mostly looking at compromises with certain benefits. The Samsung Galaxy Tab S4 doesn’t suffer from the same locked off functionality of iOS 12 with its Android architecture and has a better AMOLED screen. It also comes packaged with a stylus, which mitigates some of the cost of the Apple Pencil if you find a stylus necessary. This device retails at $649.99, making it more affordable than the iPad. The Microsoft Surface Pro 6 is another option, and may be a better fit for replacing your laptop than the iPad, with its fully functional Windows 10 OS, but it’s still costly at $799. You could always roll back to the early 2018 9.7-inch iPad if you want to save some money. This will set you back $329 and cover most of your bases, but you’ll miss out on updates like Face ID, the sleek new design, and accessories. Interested in reading more reviews? Take a look at our selection of best tablets. The 2018 iPad Pro is a stylish device of unparalleled power. With utterly seamless navigation and playback, fantastic speakers and world-class accessories and performance, this is a beautifully designed piece of hardware. Unfortunately, whilst the power is there, it is held back by its own operating system, forcing you into busywork or compromising missteps. It cannot replace your laptop just yet, but it may well make it redundant based on your use case. Product Dimensions 7.02 x 9.74 x 0.23 in.